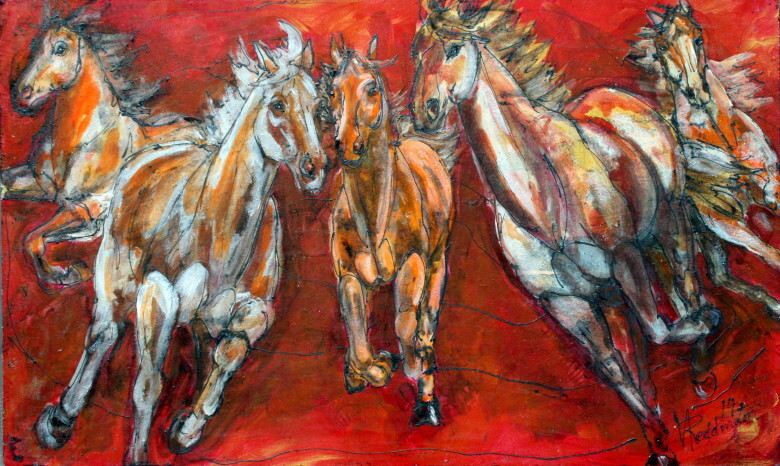 Twisp artist, Ginger Reddington, won two awards at the Equine Art 2014 Exhibit for her recent work “Now It’s A Horse Race”. The exhibit took place at Emerald Downs and was put together by The Washington Thoroughbred Association, Washington Thoroughbred Breeders and Owners Association and Emerald Downs. Ginger’s painting won the Dr. Donald & Beverly Turner and Phil & Sarah Saitta Award for Acrylic and the Equine Art Committee Poster Award, which means the artwork will appear with 2 other selections on the Equine Art 2015 poster. Congratulations Ginger!